By ideal, I am meaning that the image is either partly or entirely based on what is inside the mind rather than outside. I'm thinking here of academic ideals, fantasy, dream images and so on. The opposite is the real - so works very heavily based on observation of the real world. Abstract for me really means painterly - i.e. the emphasis is on the brush stroke, the paint and the surface of the canvas rather than an accurate, illusionistic representation. So why the graph? How does it help? It came to me while I was idling in all those Parisian art galleries that it would be helpful if I could summarise what kind of work I really loved. Because I could then make some of my own. This lead to the thought that I really didn't like most very realistic works - especially all those big mid 18th century academic works in the Musee D'Orsay. Part of what I didn't like about them was the fantasy - shakespearean characters, camels, naked ladies without a thought in their head - rather boring (and, indeed, repulsive in some cases). The browness also wasn't helping. But I found almost all of the Pompidou equally boring - plenty of colour there and lots of paint splashing, so what was the problem? So this graph came into my head. 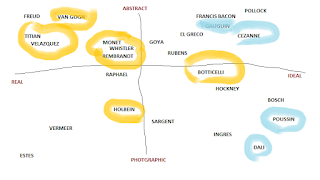 As you can see, I've added a few painters - feel free to disagree - although clearly one painter can wander all over the place. What this clarified for me is that I really don't like idealistic art of any sort. My favourites are all biased towards the realistic and towards the painterly. So I intend to think more of painterly, abstract aspects in planning my next painting, as well as insuring it has a wee bit of fantasy to it. Would your graph be different? In what way? Poussin - what would differentiate a history painter from a painter of fantasies? Is not the stilness in a Vermeer just as belonging to the ideal world as (say) Poussin's 'gathering the ashes of Phocion' or Velasquez's Mary and Martha painting? Do you think you could pick up a Cezanne apple? Would it look clearly different from the other Cezanne apple in the painting next to it? *shrug* it is a matter of taste - which is what I am trying to clarify. It is kinda a painter's viewpoint - how much of the painting is based on what I can observe out in the real world, and how much is coming from what is inside. Neither is better, and no painting is at the extreme. Rather dislike both history paintings and those of fantasies - to me there is not all that much difference. I guess the fantasy folks are more divorced from the real world - but if you are talking about swords/dungeons/dragons and so on then a lot of them seem to use a very photographic style, which I find a little icky. Hmmm. Need to think about Vermeer - I do think there is a fair bot of idealism in his work, but it is more in the set-up (i.e. he assembles a perfect scene to then faithfully copy) than in the actual painting. Provocation is good. Helps us all think. Where would be without the socratic method?